Online gambling is, in many ways, a natural fit for Bitcoin. It’s a relatively harmless, consensual kind of gaming which has been hounded so aggressively by regulators that it’s either impractically hard to use or actually illegal in many jurisdictions. Bitcoin provides a way for gaming site operators to clear much of the air and offer cheap, effortless, anonymous gambling from a web browser. And, because the block chains in questions are transparent, it’s possible for users to verify that the casino is honest — that is, that it actually does pay out at the rate that it says it does. One such casino is called BitCasino.io, which offers Bitcoin gambling in quantities down to a few dollars, and opens its wallets to public inspection. The casino generally offers various casino-games, reproduced in the web browser, using Bitcoin as the medium of exchange, and employs live dealers to run these games. 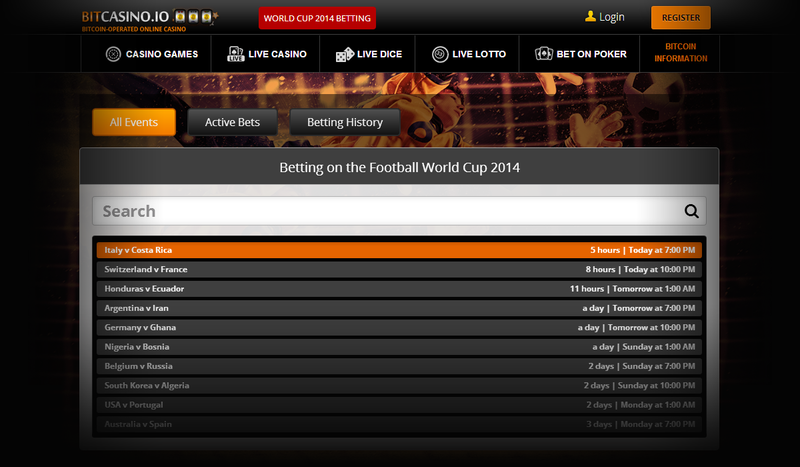 As of this weekend, the casino is expanding its suite of services to include extensive betting on the 2014 FIFA World Cup. The casino reports that it’s attracted 80,000 unique visitors to this feature of the site, and 50 BTC (approximately $30,000) spent in the first 48 hours of betting. As a result of the success, the site management plans to make sports betting a more permanent feature of the site, adding support for gambling on thousands of future events. In an effort to promote the sportsbook betting, the site is offering several promotions, including 10 mBTC (about $6.00) worth of free stake for signing up and betting on a match. 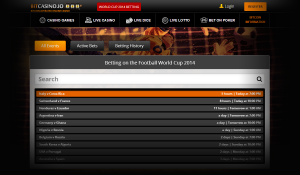 You can check out the sportsbook and make bets at https://bitcasino.io/betting/events.